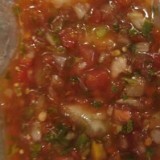 In short – these salsa are fantastic. In less then 3 days, then entire 32oz jar was empty and I moved on to the next one. And if you are worried about the shipping of fresh salsa, don’t. The salsas a shipped with an ice pack and even after shipping from Washington to Texas, the ice pack was still frozen and the salsas were nice & cold. Order yourself some today and don’t be shy. Go for the 3 pack and sample each of the heat levels to make sure you find the one that works for you. Enjoy! 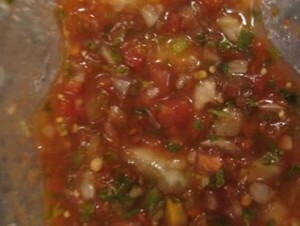 Now, if I received this salsa in a restaurant, I would be very impressed. Receiving this salsa in the mail bowled me over. Not too hot (the wife can eat it) but just enough heat so that your sinuses will open up – but not run. I cooked up some hamburger, added a can of rinsed black beans to the pan and a 16oz of the Salsa de Rosa Hot. Then I took the mixture and spooned it over nachos. Simply, easy and delicious. Highly recommended to all chileheads, although beginners may only be able to take a little at a time. Ingredients: Hand selected tomato, tomatillo, onion, jalapeno, cilantro, garlic, lemon juice, wine vinegar and salt. Shortly after opening itIn short – these salsa are fantastic. In less then 3 days, then entire 32oz jar was empty and I moved on to the next one. And if you are worried about the shipping of fresh salsa, don’t. The salsas a shipped with an ice pack and even after shipping from Washington to Texas, the ice pack was still frozen and the salsas were nice & cold. Order yourself some today and don’t be shy. Go for the 3 pack and sample each of the heat levels to make sure you find the one that works for you. Enjoy! Do I see a kernel of corn in there? Where did that come from? I want me some, looks delicious. I’m hungry, i’ll swing by and pick you up. Just ordered some now. Can’t wait to try it. These guys are local, I think I’ll go see them! After reading your review Nick I ordered some on Monday. Last nite (thrs) when I got home the package was on my door step. This is the best salsa I’ve ever bought. It tastes so fresh and is really addicting. Thanks for reviewing this product.